The northeast monsoon brought fine and dry conditions to southern China throughout the week. Temperatures were relatively cool in the mornings and evenings, but regularly rose to 31⁰C in the middle of the day. There were continuing records of the commoner passage birds from a number of places (with most reports were from the regularly watched sites of Mai Po, HK Wetland Park, San Tin, Shek Kong catchwater and Ho Man Tin); these included Oriental Dollarbirds, Black-naped Orioles, Black Drongos, Brown Shrikes, Oriental Reed Warblers, Arctic Warblers, Pale-legged/Sakhalin Leaf Warblers, Eastern Crowned Warblers, Pallas’s Grasshopper Warblers, Asian Brown Flycatchers and Dark-sided Flycatchers. There was also a noticeable arrival of wintering birds, albeit in generally small numbers c.f. October/November (and doubtless some of these will have just been passing through Hong Kong) with records of Great Cormorants, ducks (Northern Pintail, Northern Shoveler, Eurasian Teal, Eurasian Wigeon all noted), Red Turtle Doves, Ashy Drongos, Black-winged Cuckooshrikes, Stejneger’s Stonechats, Blue Rock Thrushes, Chinese Blackbirds, Taiga Flycatchers, Dusky Warblers, Yellow-browed Warblers, Zitting Cisticolas and Richard’s Pipits. The Common Pochard remained at San Tin throughout, as did the five Black-faced Spoonbills at Mai Po. Two Black-winged Kites were at Mai Po on 3rd with one there on 5th. Eastern Marsh Harriers were regularly reported from Mai Po (three on 5th), one was seen at Po Toi on 2nd and one was at San Tin on 7th. The storm-driven Red-necked Phalaropes continued to linger in reduced numbers (ten at San Tin and one at Long Valley on 6th; eight still at San Tin on 7th). Orange-headed Thrushes continued to be seen at Ho Man Tin at least until 5th with three there on 1st. The first Red-throated Pipits of the autumn were reported from Long Valley on 30 September, and up to two were present until 7th; four were also at Mai Po on 3rd. Two Olive-backed pipits were at Shek Kong catchment on 6th with one at Po Toi on 7th. Two-barred Warblers, Lanceolated Warblers, Blue-and-white Flycatchers and Little Buntings were reported from a number of sites but there were no further sightings of Tiger Shrikes or Yellow-rumped Flycatchers. Yellow-breasted Bunting: singles at Mai Po on 3rd and Po Toi on 4th. A cold front associated with the northeast monsoon brought heavy rain to the territory on 10th. It remained rather cloudy, albeit with bright periods, for the rest of the week with temperatures ranging from 22-28⁰C. First of all, late news from 4 October when an injured Yellow-legged Buttonquail was found in urban Jordan; it was taken to KFBG but died overnight. The highlight of the week under review, and a first for Hong Kong, was a Buff-throated Warbler Phylloscopus subaffinis trapped by ringers in a private area of HK Wetland Park on 9th. This uncommon warbler is a montane breeder in north Vietnam, and China from se Qinghai east to Fujian and south to north & east Yunnan, south Guangxi and north & east Guangdong. It winters south from south Yunnan east to Zhejiang, north & east Myanmar, northwest Thailand, north Laos and north Vietnam. Given its distribution, it is perhaps a little surprising that it has not been recorded in Hong Kong previously – although this may be a reflection of its relative scarcity as a breeding species in south China. The second warbler of note - and one that attracted the attention of birders and photographers - was a Manchurian Reed Warbler along the Mai Po access road from 8th – 10th. This acrocephalus warbler breeds in northeast China and southeast Russia, and winters in Cambodia, Thailand and south Laos. It is a scarce autumn migrant through Hong Kong with usually single-digit total counts (although there were an exceptional 11 in 2011 and 20 in 2012). Most individuals, however, are taken out of mist-nets in reed beds at Mai Po and twitchable birds are not easy to come by – hence the popularity of this particular bird. The other highlight of the week was the passage of Amur Falcons and Blue-tailed Bee-eaters. There was a single Amur Falcon at Mai Po on 8th, and on 10th five were noted over the Soko Islands followed by a record count of 100 at Mai Po in the late afternoon (the previous high count was 97 at Long Valley on 17 Oct 2013). After this, one was at Lam Tsuen and two were at HK Wetland Park on 11th, with one at Long Valley on 13th. Blue-tailed Bee-eaters were recorded as follows: two at Mai Po and six at Tai Sang Wai on 10th, seven at HK Wetland Park and ten at Mai Po on 11th, 12 at Mai Po on 12th, and one at Long Valley and six at Mai Po on 14th. And breaking news of two rare birds reported on the afternoon of 14th. The first was a European Golden Plover from the Mai Po boardwalk. This is only the second record for Hong Kong after the first at Mai Po on 25 October 2015. The second rarity was a Booted Warbler at San Tin fish ponds. This will be the fourth Hong Kong record if accepted. On 9th, in addition to the Buff-throated Warbler, the HK Wetland Park turned up a Thick-billed Warbler and a Siberian Blue Robin. Two Swinhoe’s Minivets and two Sakhalin Leaf Warblers were present on 10th, and on 11th a Crested Honey Buzzard and Eurasian Hobby were seen. Two Japanese Quails, a Crested Honey Buzzard and two Sakhalin Leaf Warblers were there on 12th. Mai Po had a run of good birds. On 8th, Cinnamon Bittern, Black-winged Kite, Black-naped Monarch, Lanceolated Warbler and three Yellow-browed Buntings were recorded. On 9th, there were reports of Eurasian Hobby, Long-billed Dowitcher, Oriental Cuckoo, Lanceolated Warbler, Radde’s Warbler, and Sakhalin Leaf Warbler. A Ruddy-breasted Crake was along the access road on 11th, and a Pied Harrier, two Eurasian Hobbies, three Lanceolated Warblers and the three Yellow-browed Buntings were on the reserve. On 11th a Common Kestrel and a Gull-billed Tern were seen. The 12th turned up the first Falcated Duck of the autumn along with Black-winged Kite, three Pied Harriers, Japanese Sparrowhawk, a Thick-billed Warbler and two Siberian Rubythroats. A Pied Harrier and a Blue-and-white Flycatcher were seen on 13th. Apart from the European Golden Plover, sightings on 14th included Pied Harrier, Long-billed Dowitcher and an exceptional tally of 65 Lesser Sand Plovers of the Atrifrons group - a new highest count for this group, the previous highest count being 32 at Mai Po on 18 Apr 2009. Shek Kong catchwater had Swinhoe’s Minivet, Black-naped Monarch, Radde’s Warbler and Sakhalin Leaf Warbler on 8th. A Verditer Flycatcher was there on 10th, and two were seen on 11th. Also seen on 11th were a Blue-and-white Flycatcher and two Black-naped Monarchs. A Crested Honey Buzzard was seen on 14th. On 8th, a Eurasian Woodcock was seen at Pat Heung South. On 9th, birds seen at Tai Po Kau included Ferruginous Flycatcher (only the tenth autumn record), Japanese Paradise Flycatcher, Goodson’s Leaf Warbler and Verditer Flycatcher. An Amur Paradise Flycatcher and 15 Chestnut-collared Yuhinas were present in the forest on 11th. On 14th, birds present included Japanese Paradise Flycatcher, three Eastern Crowned Warblers and a Grey-streaked Flycatcher. Long Valley held two Eurasian Skylarks and 15 Yellow-breasted Buntings on 11th. 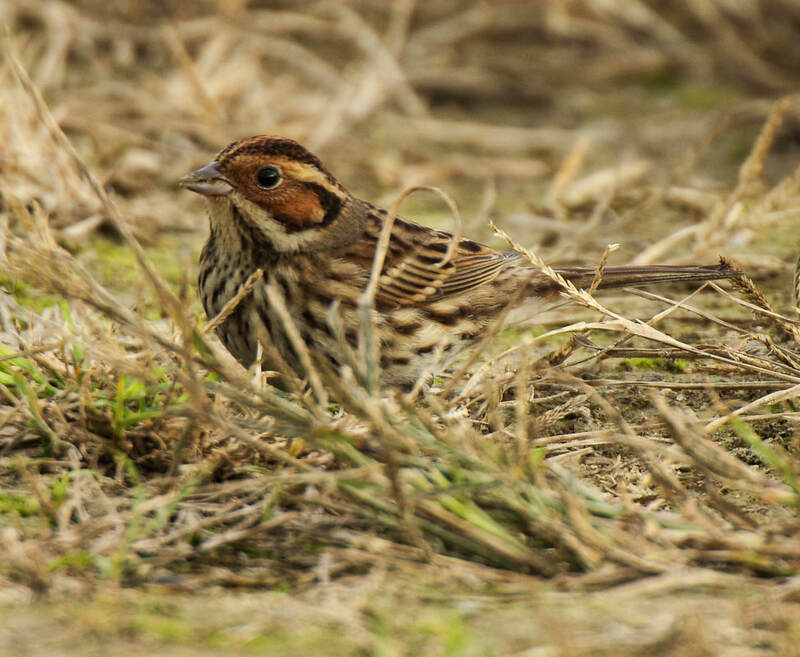 Eurasian Hobby, Eurasian Skylark, ten Yellow-breasted Buntings and a Chestnut-eared Bunting were seen on 13th. On 14th, Yellow-breasted Bunting numbers had increased to 23. An Alström’s Warbler was reported from Po Toi on 11th (the ninth HK record if accepted). On the island on 13th, an unfortunate Eurasian Woodock was photographed being eaten by a Burmese Python. Other birds reported on that day were Blue-and-white Flycatcher and Yellow-browed Bunting. On 12th, a Chinese Sparrowhawk was on Cheung Chau. Two Blue-and-white Flycatchers and an Orange-headed Thrush were at Ho Man Tin. Also on 12th, a Pheasant-tailed Jacana was noted at San Tin. On the following day the long-staying Common Pochard was again seen on its usual pond (presumably it is unable to fly); other birds present in the area on 13th included Eurasian Sparrowhawk, Pied Harrier, three Yellow-breasted Buntings and Chestnut-eared Bunting. Nine species of raptor were at Mount Davis on 14th, including Eastern Buzzard, two Crested Honey Buzzards, a Common Kestrel, an Eastern Marsh Harrier and two Japanese Sparrowhawks. A Japanese Paradise Flycatcher was also seen. Common Pochard (female), San Tin, 13 October 2018. Low pressure and the northeast monsoon brought cool temperatures (21-24⁰C) and wet conditions to the territory for most of the week. Photographs of the Booted Warbler at San Tin on 14th posted on the HKBWS website http://www.hkbws.org.hk/BBS/redirect.php?tid=27668&goto=lastpost#lastpost led to it being reassessed and relabelled as (the very similar) Sykes’s Warbler, although this still has to be verified by the HKBWS Records Committee. If accepted, this would be the third record of the species and the first since 1998. Unfortunately, there was no sign of the bird on 15th. San Tin turned up some good birds during the week, including the first Greater Spotted Eagle of the autumn on 15th. Other birds on the same day included Pied Harrier, Amur Falcon, two Lanceolated Warblers, Pallas’s Grasshopper Warbler, two Bluethroats, Yellow-breasted Bunting and Chestnut-eared Bunting. On 17th, a Japanese Quail, four Red-necked Phalaropes, 83 Eurasian Collared Doves ( a record count), 136 Red Turtle Doves, a Himalayan Swiftlet, five Sand Martins, a Lanceolated Warbler, four Yellow-breasted Buntings, two Chestnut-eared Buntings and a Black-faced Bunting were recorded. The 20th produced not only the long-staying female Common Pochard, but also a male Ferruginous Duck and a female Mandarin Duck. Also reported were Pied Harrier, Eastern Buzzard, Pheasant-tailed Jacana, Grey-headed Lapwing, five Red-necked Phalaropes, 150 Red Turtle Doves (a record count), 24 Blue-tailed Bee-eaters, a Eurasian Wryneck, a Black-naped Monarch, two Siberian Rubythroats, a Bluethroat, six Yellow-breasted Buntings and a Little Bunting. The Ferruginous Duck was still present on 21st. The European Golden Plover first recorded at Mai Po on 14th remained until at least 20th. On 17th, two Pied Harriers, a Manchurian Reed Warbler and a male Blue-and-white Flycatcher were seen on the reserve. A female Grey Bushchat was found on 20th. There were regular sightings of one or two Amur Falcons migrating over Long Valley (as well as from other widely scattered sites in Hong Kong), with a high count of seven on 17th. Other sightings from Long Valley included Japanese Quail, Eastern Water Rail, three Blue-tailed Bee-eaters, Eurasian Wryneck and 22 Yellow-breasted Buntings on 17th. On 19th, an Eastern Buzzard, the Eastern Water Rail, a Citrine Wagtail, a Lanceolated Warbler, 20 Yellow-breasted Buntings and a Chestnut-eared Bunting were seen. In addition to the buntings and the water rail, a Japanese Sparrowhawk was present on 20th. 15th: A Radde’s Warbler, a Sakhalin Leaf Warbler and a Pale-legged Leaf Warbler were at Tai Lam CP. A Crested Honey Buzzard and an Amur Falcon were at Sha Lo Tung. 16th: The HK Wetland Park turned up four Amur Falcons, two Eurasian Hobbies and a Pale-legged Leaf Warbler. Another Eurasian Hobby was at Lam Tsuen. 17th: A female Watercock and three Sakhalin Leaf Warblers were at the Wetland Park. Cheung Chau held three Swinhoe’s Minivets. Birds at North Lantau included three Sakhalin Leaf Warblers, six Pale-legged/Sakhalin Leaf Warblers and a Siberian Rubythroat. 18th: A Himalayan Swiftlet was at Tai Sang Wai. There was a Japanese Paradise Flycatcher at Shek Kong catchwater, and at the Wetland Park a Japanese Sparrowhawk, a Eurasian Hobby, a Sakhalin Leaf Warbler, and a Two-barred Warbler were seen. Po Toi held two Eurasian Woodcocks, and at Hong Kong Harbour a Pheasant-tailed Jacana was observed flying past Kennedy Town. 19th: Birds at Shek Kong catchwater included Mugimaki Flycatcher, Japanese Paradise Flycatcher and Verditer Flycatcher. 20th: Ho Man Tin held Radde’s Warbler and two Two-barred Warblers. At Yi O, Lantau, four Oriental Greenfinches, three Yellow-breasted Buntings and two Little Buntings were seen. A Bianchi's Warbler was reported from Tai Po Kau; this would be the 8th Hong Kong record if accepted. 21st: Shek Kong catchwater turned up Asian Stubtail, Eastern Crowned Warbler, two Two-barred Warblers and a Verditer Flycatcher. A number of migrants were seen at Mount Davis including Eurasian Hobby, Oriental Dollarbird, Black-naped Oriole, Amur Paradise Flycatcher, Taiga Flycatcher,eight Asian Brown Flycatchers, a Two-barred Warbler, five Yellow-breasted Buntings and three Little Buntings. A Pheasant-tailed Jacana was seen at Shuen wan near Tai Po. At the Wetland Park a Cinnamon Bittern, a Japanese Sparrowhawk, two Eastern Buzzards, two Eurasian Hobbies, a Sakhalin Leaf Warbler, a Two-barred Warbler, and a Siberian Rubythroat were recorded. A female Small Niltava was photographed at Po Toi - a new early date. See http://www.hkbws.org.hk/BBS/redirect.php?tid=27676&goto=lastpost#lastpost . The end of the month was dominated by the northeast monsoon which brought clear skies and dry conditions to the territory. Temperature were up to 28⁰C in the middle of the day, but fell to the low twenties at night. There were plenty of migrants around with a number of sites being particularly productive, namely Mai Po, San Tin, Lok Ma Chau and Long Valley in the northwest New Territories, Ho Man Tin in urban Kowloon, Mount Davis on Hong Kong Island, and the Fan Lau/Yi O area in southwest Lantau. Geese & Ducks: A Goose sp. (Greater White-fronted?) flew over the car park at Mai Po on 29th. The usual dabbling ducks (Eurasian Wigeon, Northern Shoveler, Northern Pintail, Garganey and Eurasian Teal) were conspicuous at Mai Po, particularly out in Deep Bay, although, as is to be expected, virtually all of the drakes were still in eclipse plumage. The first Tufted Duck of the autumn was at Mai Po on 26th. The male Ferruginous Duck was again at San Tin on 22nd and 26th. Both the Mandarin Duck and the Common Pochard were present through to 31st, although the former was often elusive. Three Falcated Ducks and two Chinese Spot-billed Ducks were at Lok Ma Chau on 31st. Quails, Spoonbills & Herons: Single Japanese Quails were at Long Valley on 24th & 27th, and at San Tin on 28th. Sixty Black-faced Spoonbills were at Mai Po on 25th, and 55 were seen in flight at San Tin on 30th having been flushed from the adjacent ponds at Lok Ma Chau by a Greater Spotted Eagle. A Eurasian Bittern was at Mai Po on 25th. There were regular sightings of one or two Yellow Bitterns at Mai Po and a Cinnamon Bittern was at San Tin on 24th. Raptors: A Black-winged Kite was at Mai Po on 24th & 25th. Three Crested Honey Buzzards were seen between Shek Pik and Fan Lau on 27th, and another was seen at Fan Lau on the following day. A Greater Spotted Eagle was at San Tin on 28th & 30th, and at Lok Ma Chau on 31st. A Grey-faced Buzzard was reported from Po Toi on 25th. Eastern Buzzards were widespread with three in flight together at Mai Po on 26th and three at HK Wetland Park on 28th. Eastern Marsh Harriers were regularly noted at Mai Po with four there on 27th, and single Pied Harriers were seen on 23rd and 25th. A Pied Harrier was also at Lok Ma Chau on 22nd and at San Tin on 31st. Single Japanese Sparrowhawks were at Ping Yeung on 23rd, Long Valley on 25th and Mai Po on 27th. Common Kestrels and Eurasian Hobbies were seen at several sites and Amur Falcons continued to move through with notable counts of 27 near Mai Po on 23rd and 87 at Long Valley on 24th; both of these flocks were observed towards dusk. Crakes to Terns: A Slaty-legged Crake was at Ho Man Tin on 24th. An Eastern Water Rail was reported from Long Valley on 28th, and a Ruddy-breasted Crake was at Mai Po on 29th. A Watercock was seen at HK Wetland Park on 28th. The first Eurasian Coot of the season was at San Tin on 24th. A Yellow-legged Button-quail was at Ho Man Tin on 22nd, and another was at San Tin on 28th. Smaller waders amongst the wintering Dunlins and Kentish Plovers out in Deep Bay included a few Lesser and Greater Sand Plovers, Terek Sandpipers, Great Knots, Red-necked Stints and Broad-billed Sandpipers. Several Temminck’s Stints were present throughout on a drained pond along the Mai Po access road. A Grey-headed Lapwing was at San Tin on 24th, with three there on 28th, and two were at the regular Kam Tin River site on 29th. The vagrant European Golden Plover was seen regularly on the mud flats at Mai Po at least until 28th. A single Far Eastern Curlew was among the Eurasian Curlews on the scrape on 24th. Four Pheasant-tailed Jacanas were at Lok Ma Chau on 22nd, with six there on 31st. Two Red-necked Phalaropes remained at San Tin until at least 24th, and one was still present on 30th. An Oriental Pratincole was at HK Wetland Park on 28th. The first Black-headed Gull of the autumn was at Mai Po on 25th. The long-staying Gull-billed Tern was seen again at Mai Po on 26th & 27th. Two Whiskered Terns were at San Tin on 22nd and one was at Mai Po on 25th. Doves to Hirundines: A Grey Nightjar was at Ho Man Tin on 25th. Two Himalayan Swiftlets were seen at Long Valley on 25th and nine Blue-tailed Bee-eaters flew over Mai Po on the same day. Three Eurasian Wrynecks were at Lok Ma Chau on 22nd, and singles were at Mai Po on 23rd, Long Valley on 25th and San Tin on 30th. A Speckled Piculet was at Shek Kong catchwater on 26th. A Bay Woodpecker was at Sha Lo Tung on 27th - a new site for this species. Black-winged Cuckooshrikes were widespread in suitable habitat. A Bull-headed Shrike was at Ho Man Tin on 29th & 30th. A Black-naped Oriole was at Mai Po on 26th and three were at Mount Davis on 27th. Hair-crested and Ashy Drongos were reported from several sites. A Eurasian Skylark was at Long Valley on 28th. Small numbers of hirundines – Barn Swallows, Red-rumped Swallows and Sand Martins - were observed moving across the northwest New Territories; a flock of 40 Sand Martins was at Mai Po on 25th. Warblers: Two Asian Stubtails were at Fan Lau on 28th, one was at Kowloon Bay on 28 October, and one was at Ho Man Tin on 30th. Dusky Warblers were commonly reported in the northwest New Territories; 50 were counted at San Tin on 28th. Reports of the far less common Radde’s Warbler involved singles at Ho Man Tin on 22nd, 25th & 30th, four at Mount Davis on 27th with one there on 28th, one at San Tin and three at Fan Lau on 28th, and one at Lam Tsuen on 29th – a good autumn for this species. A rare Yellow-streaked Warbler was trapped at Mai Po on 29th. Yellow-browed Warblers were widespread and the first Pallas’s Leaf Warbler of the autumn was noted at Fan Lau on 28th. A few Arctic and Two-barred Warblers continued to be reported. Sakhalin Leaf Warblers Phylloscopus borealoides were reported from several sites whereas there were only three claims of Pale-legged Leaf Warbler Phylloscopus tenellipes. The HK Bird Reports state that “Based on trapping records, tenellipes is more common than borealoides in a ratio of 2:1, with this ratio being 3:1 in September and1:1 in October.” Autumn records so far this year, now that birds can be differentiated on call, seem to generally collaborate this, with Pale-legged Leaf Warbler being much commoner than Sakhalin Leaf Warbler in September (indeed, there were only two claims of the latter at the very end of the month). As to October, it seems that Sakhalin Leaf Warbler is, in fact, commoner than Pale-legged Leaf Warbler. Single Eastern Crowned Warblers were seen at Shek Kong catchwater and Ho Man Tin on 26th. Either a fokiensis Goodson’s Leaf Warbler or a Claudia’s Leaf Warbler was at Shek Kong catchwater on 24th, and a nominate Goodson’s Leaf Warbler was at Fan Lau on 28th. Oriental and Black-browed Reed Warblers were regularly recorded in the wetland areas of the northwest New Territories; there was a particularly high count of 101 Black-browed Reed Warblers at Lok Ma Chau on 22nd (although not quite the highest total ever, which is of 120 at Mai Po on 13 October 2001). Two Thick-billed Warblers were trapped at Mai Po on 29th, and singles were also seen at Sai Kung on 30th and Lok Ma Chau on 31st. A Pallas’s Grasshopper Warblers was reported at Kowloon Bay from 27th -31st (see http://www.hkbws.org.hk/BBS/viewthread.php?tid=27701, and one was singing at San Tin on 30th. Lanceolated Warblers were noted in ones and twos at Lok Ma Chau, San Tin, Long Valley, HK Wetland Park and Kowloon Bay, although the peak count was ten at Mai Po on 29th. A few Zitting Cisticolas were present at Long valley throughout, and a Golden-headed Cisticola was at Ping Yeung on 23rd. White-eyes to Chats: The first Chestnut-flanked White-eye of the season was at Sha Lo Tung on 27th. 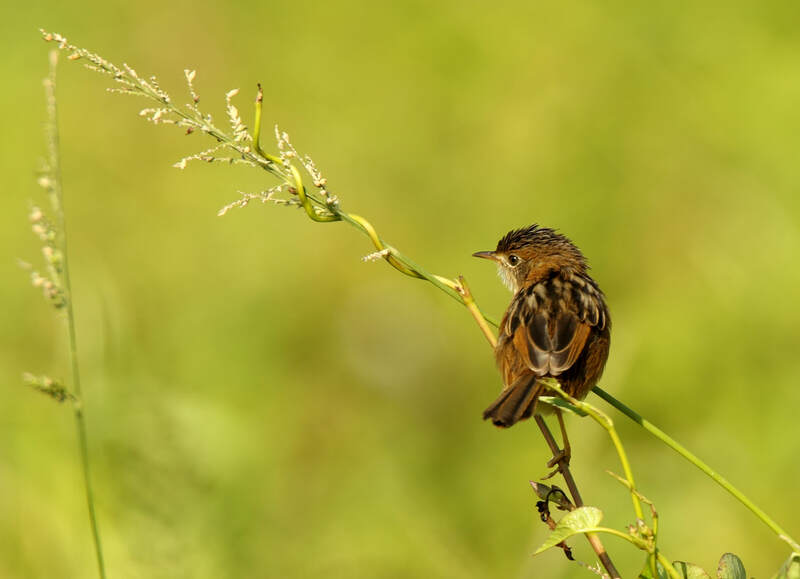 There was a scattering of sightings of Chinese Blackbirds, Siberian Rubythroats and Buethroats in small numbers in the northwest New Territories; Stejneger’s Stonechats were also widespread there, with a peak count of 20 at Lok Ma Chau on 22nd. A rare male White-tailed Robin (11th record if accepted) was at Ho Man Tin on 24th. A Red-flanked Bluetail – the first of the season – was at Fan Lau on 28th, and two were at Cheung Chau on 29th. The first Daurian Redstart of the autumn was at Mai Po on 25th and there were widespread reports of the species from 28th onwards. Three Rufous-tailed Robins – another first for the season – were at Ho Man Tin on 29th. Also at Ho Man Tin on 29th was a late Siberian Blue Robin, with the first thrushes of the autumn - single Japanese and Grey-backed Thrushes – seen there on the same date. A Siberian Thrush was also reported at Ho Man Tin on 29th. Flycatchers: Black-naped Monarchs were reported from Lok Ma Chau, Cheung Chau and Mount Davis, singles apart from two at the latter site on 28th. An Amur Paradise Flycatcher was at Shek Kong catchwater on 25th.Two Japanese Paradise Flycatchers were seen at Tai Po Kau on 23rd, and singles were at Shek Kong catchwater on 25th and 31st. A Grey-headed Canary-flycatcher was at Shek Kong catchwater on 26th (although the first birds of the autumn were two there on 20th). Asian Brown Flycatchers were widespread and Dark-sided Flycatchers were at Sha Lo Tung and Mount Davis on 27th, and San Tin on 28th & 31st. A Grey-streaked Flycatcher was at Ho Man Tin on 22nd & 23rd. Verditer Flycatchers were reported from Shek Kong catchwater and King’s Park on 22nd, Ho Man Tin on 25th (two birds), Sha Lo Tung on 27th (two birds), and Mount Davis on 27th & 28th. Possible Green-backed Flycatchers (both 1st-winter males?) were photographed at Ho Man Tin on 22nd and at Cheung Chau on 28th; if accepted, these would be only the fourth and fifth Hong Kong records of this species. Single Mugimaki Flycatchers were at Mount Davis and Tai Po Kau on 28th, and at Ho Man Tin on 29th & 30th, and there were several widespread reports of Taiga (Red-throated) Flycatchers. Sparrows to Buntings: A total of c. 20 migrating Fork-tailed Sunbirds were seen flying south from Fan Lau headland on 28th. Russet Sparrows occurred at Long Valley from 24th to at least 29th, with a peak count of nine on 25th. A Forest Wagtail was at Cheung Chau on 26th. A male White Wagtail of the race lugens was along Mai Po access road on 24th & 25th. Two ocularis White Wagtails were at Long Valley on 25th. There were regular reports of Richard’s, Olive-backed and Red-throated Pipits from the northwest New Territories. A Grey-capped Greenfinch was at Fan Lau on 28th. A Tristram’s Bunting was at Po Toi on 25th. 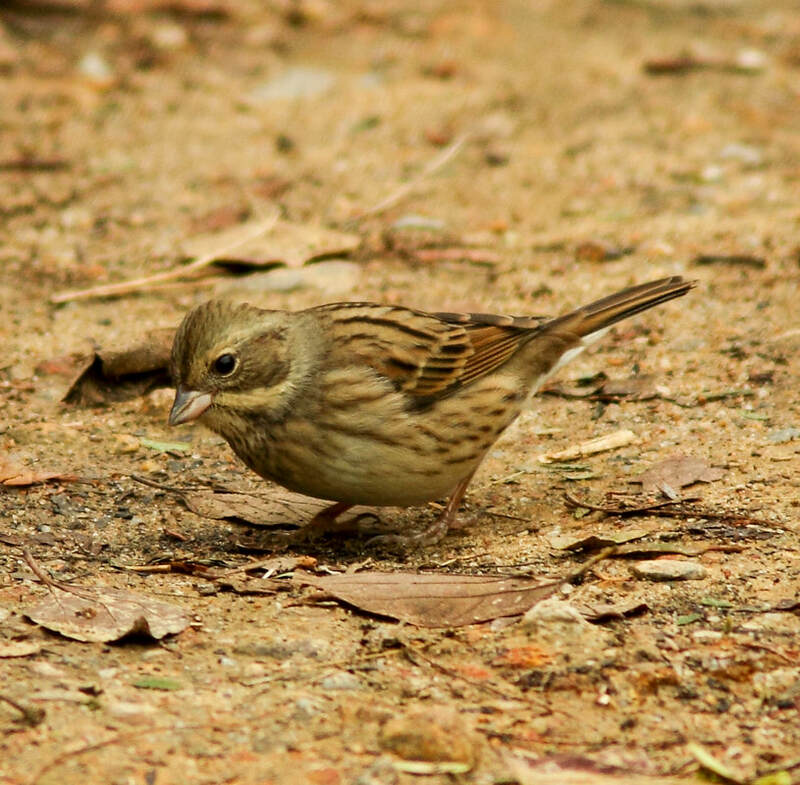 Chestnut-eared Buntings were reported from Ping Yeung (three on 23rd) , San Tin (max. five on 28th), Long Valley (max. two on 26th), Fan Lau (one) and Yi O (three) on 28th, and Lok Ma Chau on 31st (12 – the highest number since the early 1970s). Single Little Buntings were reported from several sites during the period under review, and four were at Shek Kong on 30th. Reports of Yellow-breasted Buntings came from Mai Po, Long Valley, San Tin, Yi O, Pui O, Po Toi, Mount Davis and Lok Ma Chau, the highest count being 12 at Long Valley on 24th. Eight Chestnut Buntings were at Mount Davis on 27th & 28th, and five were seen at Fan Lau and six at Yi O, also on 28th. Reports of single Black-headed Buntings came from Long Valley on 21st and 25th, Po Toi on 25th, and San Tin on 28th; two were together at Long Valley on 29th. A Red-headed/Black-headed Bunting was flushed at the Wetland Park on 28th. 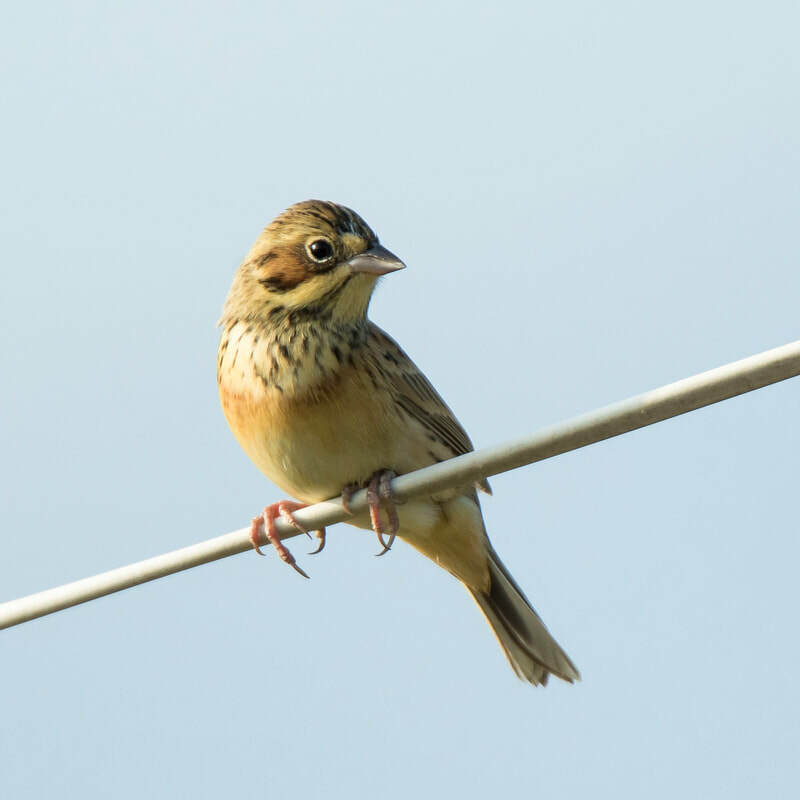 Based upon established patterns of occurrence, this is almost certainly a Black-headed Bunting. (Extreme dates for Red-headed Bunting are 23 December to 5 February, whereas the main passage of Black-headed Bunting occurs in October & November.) A Black-faced Bunting was at San Tin on 28th, and there were reports of other singles at Lam Tsuen and Shek Kong on 30th. A rare Pallas’s Reed Bunting was also seen at San Tin from 28th till the end of the month.